VICRC received 306 lbs. of non-perishable pantry goods! In May, we received an incredibly generous 5,835 lbs. 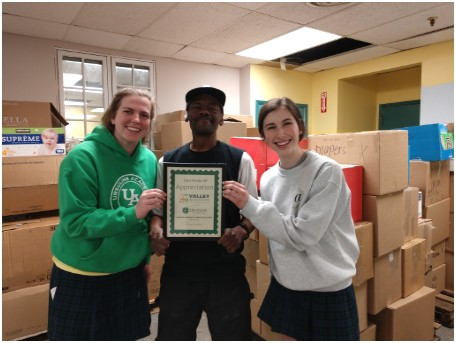 of non-perishable food and household items from Ursuline Acadamy’s Annual Food Drive to substantially stock our pantry shelves! Thank you to The First Presbyterian Church, Glendale for sponsoring this 8th Annual drive as their mission outreach event! In June, we received 2,158 lbs to fill our pantry shelves! As part of Friendship United Methodist Church’s VBS Collection, 363 lbs of non-perishables were donated to our food pantry. Each year, Valley Temple distributes empty grocery bags at Rosh Hashanah and members are asked to return the bags filled with food, toiletries and baby products by Yom Kippur. This year VICRC received a wonderful donation of 2,242 pounds of non-perishable pantry staples, as well as highly requested household items. In October, Statements collected nearly 400lbs. of non-perishable food on behalf of VICRC. Annually in November, Hartwell Schools host a Thanksgiving food drive, requesting each grade donate a specific item to stock the shelves of our pantry. In 2017, Hartwell collected 326 lbs, received by VICRC in January, and in 2018, Hartwell collected 246lbs. THANK YOU TO ALL FOR THEIR GENEROSITY & HARD WORK!